Guildhall Square has truly rooted itself as the beating heart of Southampton. The O2 Guildhall, the city’s premier gig venue, is welcoming bigger stars by the day. Its cocktail bars and restaurants are the hottest place to spend Saturday nights. Even the square itself is advertised as “versatile and contemporary space” for everything from performance art shows to seasonal events. Now, as Studio 144 – the new home of NST City, John Hansard Gallery and City Eye – opens its doors, Southampton can finally show off its very own “Cultural Quarter”; one that’s been fifteen years in the making. Standing as gatekeepers where Guildhall Square meets East Park, the ‘North’ and ‘South’ buildings of Studio 144 are two striking pieces of modern architecture. With giant glass facades, cubic fronting and pleasing symmetry, it’s hard to believe that the project was first dreamt up before the turn of the millenium. Initially, Studio 144 had a planned opening date of 2002 – the year a lot of current undergraduates started primary school – but was bombarded with problems and delays. Surviving three governments, five general elections and a global financial crisis is no mean feat, but art has a romantic notion of persevering; and maybe even maturing, like fine wine. If anything, the time spent perfecting Studio 144 makes its opening even more of a milestone for Southampton. The University has been a key player in making the city’s vision a reality. 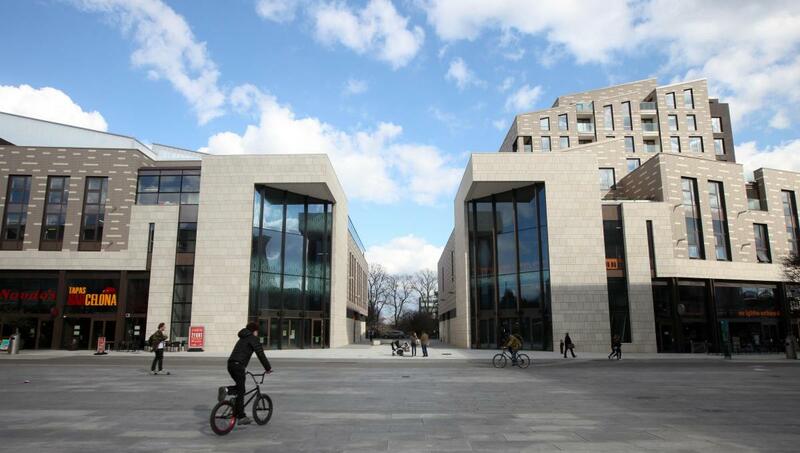 Two of the three businesses now homed within this slice of Southampton’s Cultural Quarter came into life at Highfield Campus. Students will likely be most familiar with the Nuffield, a building set apart by its huge and now weary-looking mint green roof. The theatre, which stands prominently next to the Interchange, remains very much open for business, albeit rebranded as ‘NST Campus’. 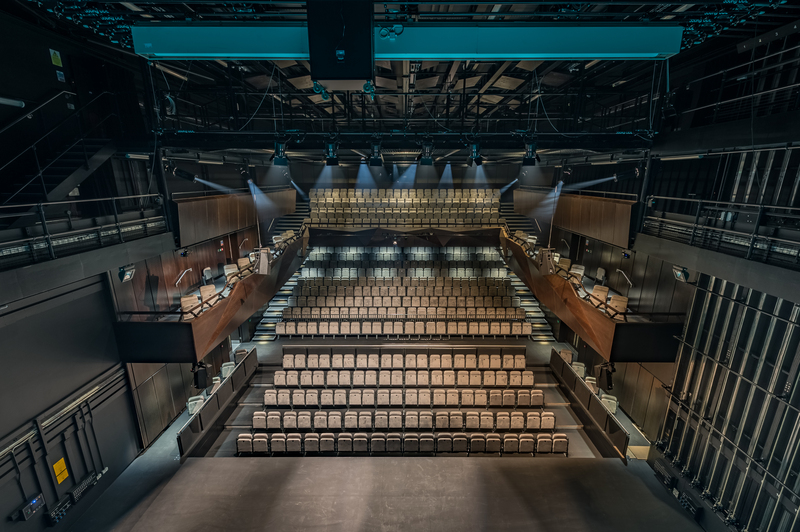 Its brand new sister location, NST City, is designed to offer an alternative theatrical space to showcase Nuffield’s inventive and unique original productions. The John Hansard is more of a hidden gem. Tucked away at the back of campus, its original venue – described by director Woodrow Kernohan as a “specialised” gallery – is now closed ahead of the full opening of Studio 144. When the move is completed, the exhibition will be public-facing and public-serving for the first time. Kernohan and his team’s steely determination to focus their work on the Southampton community has seen John Hansard completely reinvent themselves for their new home. After a series of “housewarming” events (including displaying a Transformer built from a 1988 Ford Fiesta) that coincided with the launch in early February, the gallery opens in full later this spring. Its neighbour in the South Building is City Eye, a council funded organisation set up to support community filmmaking in Southampton. Although they are by far the smallest of Studio 144’s new occupants, their facilities are still impressive, including a professional recording studio and a suite equipped with both Macs and PCs. 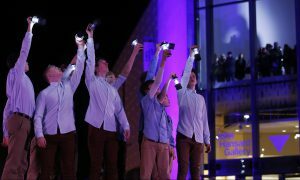 But looking beyond the tech, its director Susan Beckett dreams more of a creative space where ideas can be forged, and a generation of young filmmakers can come together to make something Southampton can be proud of. Whilst John Hansard and City Eye have shaped their spaces to their own strengths, the 30 million spent on Studio 144 is perhaps felt best in the North Building. A trip to the theatre naturally invites audiences to forget about the real world for a few hours, but there’s much more to NST City than its productions. The aesthetics of its foyer and reception area feel as much a part of the ‘art’ as what plays out on stage, with towering glass windows framing one of the best views in Southampton. As you enjoy the sun setting on the twinkling Solent in the distance, you can enjoy a locally brewed beer or a fine wine from Tyrells, a bar named after a department store that stood on the site for over a hundred years. 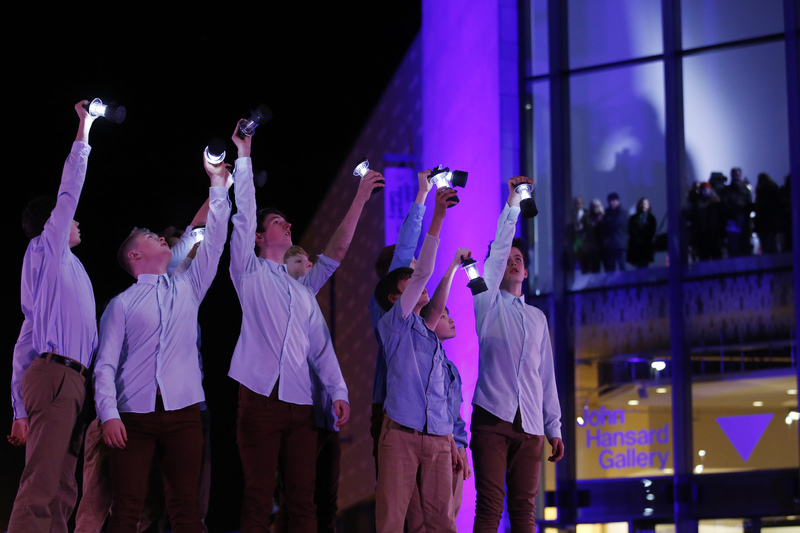 It’s all part of the experience – just be careful not to miss the start of your show! But when you do venture into the auditorium, it doesn’t disappoint. 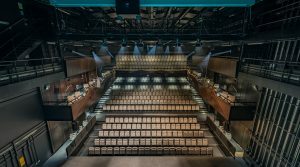 The stage is fully flexible, with modular seating that can be chopped and changed depending on the needs of the production. For NST City’s opening production, The Shadow Factory, the theatre is closed in around a giant slab of concrete, brought to life with intricate projections and lighting. The space’s potential for original material is limitless, especially when contrasted with the overtly conventional layouts of NST Campus and the Mayflower Theatre. The “thinking outside the box” nature of the auditorium is perhaps symbolic of what Studio 144 is trying to achieve. This multi-million mammoth of a project is dedicated to inspiring the next generation of home-grown artists right here in Southampton. The Shadow Factory runs until Saturday 3rd March at NST City. John Hansard Gallery and City Eye are due to open in full to the public in late spring.